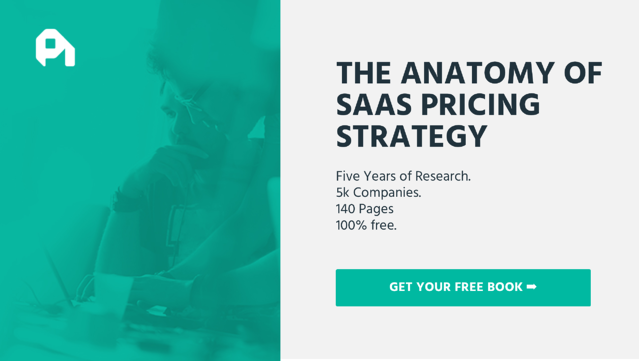 Raising prices is the ultimate conflict for a SaaS company. On one hand, a price increase leads to more revenue and better unit economics. On the other hand, it can lead to angry current customers and potentially fewer future customers. This is understandable. Price increases are scary. People balk at the idea of asking for any money, let alone more. But raising prices is inevitable for a well-run company. Not understanding this, and not changing pricing is a fatal mistake. Price raises are a sign of a well-functioning team and a growing product, showing that you are constantly reassessing and realigning the value you provide for your customer. But they are scary. Pricing strategy is in our blood, so here is how we coach our customers to talk about price increases with their customers to focus on value and show exactly what customers will get in return. Your product grows. You add or remove features, but you should overall increase the value that your customers can get from using your product. This growth might come every six months as you release new features, or it could be daily if you have a policy of continuous integration. Your understanding grows. You get to know your market and get to know your customers. Every day comes with new insights into what matters to these people and what they truly value. Less to invest. Adding value month-on-month only works if the company can afford the growth. You can't if prices are set too low. Your product will stagnate if price doesn't match value. Lowered expectations. As your product becomes “cheap” for the value it offers, it starts to match those expectations. Your customer acquisition cost (CAC) will have to be lowered to balance lowered lifetime value (LTV), so newer low-value customers will be acquired. The product will then start to shift towards their needs and value and away from your initial customers. You'll lose those customers, but they'll also lose the ability to succeed with your product. Less understanding. Without price increases fueling your curiosity, you'll lose this window into understanding your customers. A price change, both pre and post, is a great opportunity to elicit feedback and find out more about your customers. This is a constant cycle, so your prices have to be on a constant cycle as well. If you don't, you'll stagnate, lose revenue, lose growth, and lose your company. 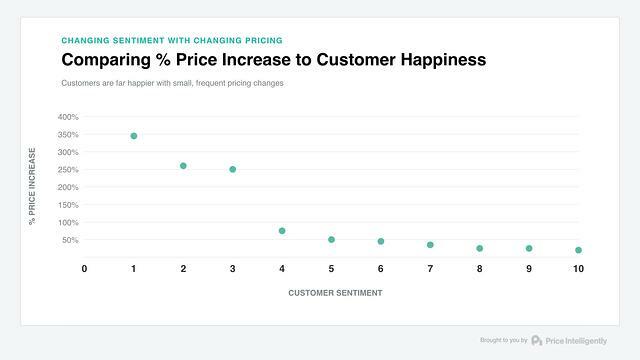 Customers are way happier with lower price increases. Popes and bears come to mind. This type of graph might be taken as evidence against price increases. It isn't. You can get pretty much perfect NPS scores and still increase your pricing. What this graph is actually evidence of is that you have to constantly be thinking about price increases. If you leave it too late and you suddenly realize you have to increase prices 100% to maintain your unit economics, customer satisfaction will take a hit. But if you are iterating on your pricing and making smaller incremental changes, you can increase prices by 20-30% and still maintain high NPS scores. But if you are truly on top of pricing, even this will be a large change. By thinking about pricing in terms of testing and “sprints,” as you do product, you can make smaller changes that track your product and keep customers happy. Feature value analysis—if you have recently released new features, are these making an impact on your customers? Any shift in your most/least valued features could mean that you need to make changes in pricing, or at least in the way you package your tiers. Price sensitivity—obviously important knowledge to have. You have to have a constant understanding of your customers' willingness to pay. If you are raising prices outside of these parameters, you will upset people and lose customers. By understanding the boundaries of your pricing, you can push them with confidence. Unit economics breakdown—you want price increases to improve unit economics. But unit economics involves more than just revenue. It incorporates the lifetime of the customer and acquisition costs, both of which can be impacted by price changes. Then you need to develop your new pricing and review with select customers. If you've got a Slack channel set up for early adopters or your community, reach out to a few and ask them about the issues they would have with the new pricing. In tandem, run an impact analysis for your current customers. While you are getting that qualitative feedback from customers, you'll also need a quantitative understanding of what will happen under the new pricing structure. By seeing how your current customers will be affected, this will give you a sanity check for the change, and also give you the chance to reach out to any that might be in line for the biggest increases. While you are working on those, hone your communication plan. You need to be transparent about your new pricing. Working out what you are going to say, to whom, and when is possibly the most critical part of rolling out price changes in terms of keeping satisfaction high. Finally, launch. And get feedback! This is why pricing requires more than a single individual. It should be a team endeavor just like everything else. This scheme, with one week downtime, can repeat every two months. 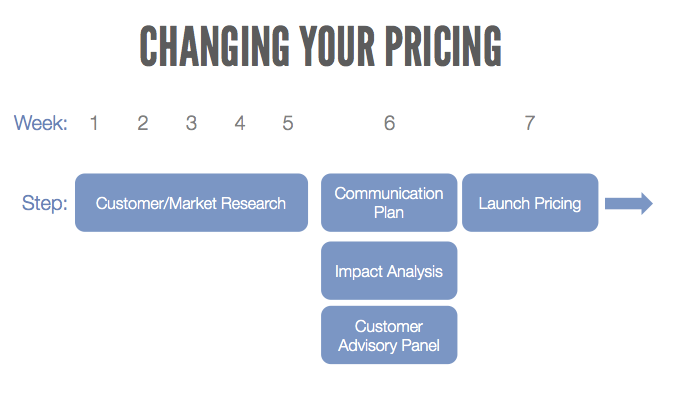 In a single year you could have six pricing changes that track the changes in your product, company, and customer. Not all of these have to be price increases. It could be that your research finds too many customers will be affected by a price increase, or that one isn't warranted at the moment. Instead, your testing could show that you need to reformulate your packaging or positioning to offer better value this sprint. That change can be made, then during the next round you can look to changed pricing to factor in these changes. If there is one concept that is foundational to pricing strategy, it is this. What matters is the value people will get in exchange for the price, not the price itself. This is why communication is the important part of a price raise. Anyone can raise prices, but raising prices and customer satisfaction requires a strong understanding of your customers' valued features and willingness to pay, which you get from your research above. A strong communication plan that frames the price increase in these terms. It needs to be to the point. Don't waffle on about your achievements so far. Get to the point, and that point is value. You should decide with your team the core value proposition that best aligns with your new pricing. This should then be front and center of your email to current customers, your blog post announcing the change, and in the brains of your customer success team when they start to be asked questions. If the increases are small, as they should be if you are constantly iterating and want to keep satisfaction high, then you can simply include them in the change. Some will churn, but if value = price, most will stay. If it's a big change, then you can grandfather them into their current rate. This means that their price is set to what was initially promised, no matter what increases you implement in the future. This can work for a handful of customers, but defeats the purpose if it goes beyond that. Your best bet for keeping customers and satisfaction high is a grandfather discount. This ties them into their current rate for a predetermined time period, say the next year. When the year is up, their pricing increases in line with all other customers. This is also a great way to tie customers into long-term, annual plans. Say that they can “lock in” their current price for the next year if they upgrade before the price increase goes into effect. It needs to ask for feedback. This is vital. Part of the reason for a price change is to align value and price for everyone. You will get feedback from your select customers during testing, but you'll get a better understanding from all your customers if you open up communication channels with them during price changes. This is one of the things founders hate about price changes, but it is the only way you get better. Not everyone is going to get it. You will lose customers in the short term. But in the long-term, by showing customers the value they get for the price, the pricing can be anything as long as it truly represents that value. 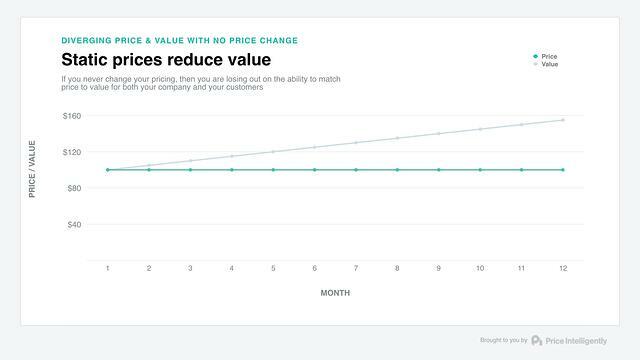 Price increases are scary only if you don't understand what pricing is—the exchange rate of value for your product. Once you understand that you are increasing value, you'll understand you can increase pricing iteratively. This makes sure you don't leave money on the table as you get better, and makes sure that your customers get a product that they are satisfied with.